In his younger days, my father used to enjoy Saturday night carousing a wee bit more than was prudent. He didn’t own a car (which was probably a good thing). His main mode of transportation was the local bus. After working hard all week, he felt entitled to cut loose on Saturdays so he and a friend would board the bus and head for the nearest city, which was Charleston. Meeting up with more friends at their favorite bar, they’d have a few beers and shoot pool. There was always music, and my father loved music—especially that of Hank Williams. The more of old Hank’s songs that were played on the jukebox, the more beer my father drank, thus becoming quite inebriated by midnight. Back then, alcohol could not be sold on Saturday night after midnight, so for him and his buddies, the fun was over when the hands on the clock were straight up. Later in life, he had many stories to tell about those Saturday nights. But one of them amused me more than the others. He’d say, “I bought the record, Walking the Floor Over You (Hank Williams) at least three times, but never got home with it!” Then he'd clap his hands together like a gleeful child and laugh heartily. My dad loved to laugh. Some of you will, no doubt, remember that those old 78 rpm records were easily breakable, although chances are, in his drunken stupor; he left his records on the bus. They say the older one gets, the more he/she remembers the past. I must be getting very old because I have more stories to tell than anyone I know. And many of them are about my father. Nobody knows, except those who were closest to him, what a colorful character he was. I believe I could write a whole book about him. 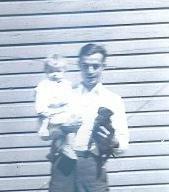 My dad holding me and our puppy. I've noticed you have a lot to say about your dad. Nothing wrong with that. you loved him. Please do write a book about him peg. I'm sure all your blogger friends would want it. I've read your stories about both your parents. It seems like you loved them very much. you must have had a happy childhood.